Landel generally offers direct end using customers a 30 day money back guarantee. Resellers are encouraged, but not required, to do the same for their customers. Returns under this policy by Landel customers to Landel are the responsibility of Landel; returns under this policy by the reseller’s customers to the reseller are the responsibility of the Reseller. Resellers should refer their end using customers directly to Landel for issues related to warranted repairs. 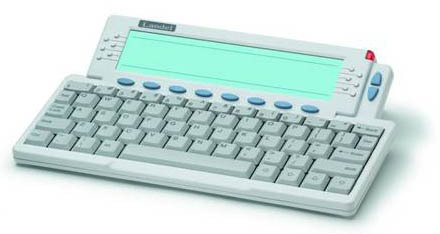 Simple device with full keyboard capable of sending and receiving text-based email. Easy installation for use with a standard phone line. Insert the phone line and the power cord and you’re ready to go. Red flashing light notifies user of incoming email messages. Pressing the READ button loads new messages for viewing. Stores up to 100 email addresses. Functions as a caller ID system. Lists the last 100 calls you have received. Ability to store up to 100 phone numbers in a phone book for easy dialing. Ability to print to fax machines. 5 free faxes per month come standard with all subscriptions. Increased number of faxes per month available for additional cost. Safe from viruses and hackers as it is a device not a computer. Email service and account setup is provided by Landel Telecom through monthly, quarterly, or annual plans.